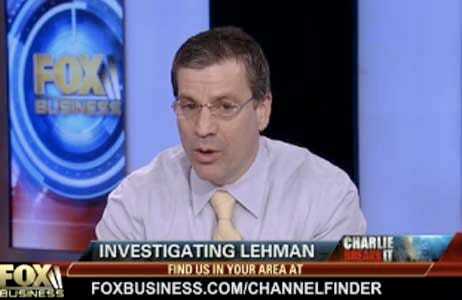 Fox Business reporter Charlie Gasparino weighs in (via ZeroHedge):The man who first shined the light on deceptive accounting practices at Lehman Brothers in the spring and summer of 2008 may once again be asked to offer his two-cents at Congressional hearings investigating the firm’s shady dealings, FBN has learned. Sources tell FBN that the House Financial Services Committee is weighing whether to call short seller David Einhorn, either as a public witness at the hearings or for a private discussion with staffers investigating allegations that senior executives at Lehman used improper accounting techniques to hide the disastrous nature of the firm’s balance sheet months before it imploded and was forced to declare bankruptcy. And we’re guessing he may once again not end up going.